A clinically viable “smart” stent that can wirelessly transmit real-time blood flow information to an external receiver has been developed by researchers at the University of British Columbia. The technology, which requires no battery or active circuitry to function, may enable patients with stents to receive more timely treatment for a common, potentially fatal complication known as in-stent restenosis. While stents may provide a significant health benefit — propping open narrowed arteries to restore normal blood flow — the stent implantation procedure itself, which involves “smashing” the offending plaque against the arterial wall, tends to traumatize the blood vessel and trigger the body’s immune response. As a result, arterial cells at the stent site proliferate, progressively re-narrowing the vessel along with any fat, cholesterol and calcium that also accumulate on the stent’s inner wall. This re-narrowing can be monitored by tracking local blood pressure, which shifts when blood flow is obstructed. But previously reported stents with self-sensing and wireless communication capabilities feature elements — electronic components positioned on the exterior of the stent, for example, or joints held in place with adhesives — which would render them impractical for clinical use. Stenting is a mechanically demanding process that requires the stent to be crimped, carefully guided through a blood vessel and expanded against the arterial wall, and reported smart stents are not suited to the task. When blood flow is obstructed inside a stented artery, the UBC-developed smart stent detects the resulting change in local blood pressure and sends a warning to an external handheld reader. To address these drawbacks, the UBC team laser-microwelded the sensor chip and stent together and coated the stent with gold and polymer, which not only increased the strength and anti-corrosive properties of the device, but also significantly improved its electrical properties relevant to sensing resolution. The resulting stent can be implanted into even small arteries using standard human clinical procedure, is visible with X-ray imaging and provides accurate blood pressure readings in a range applicable to humans, including the earliest stages of restenosis. The effectiveness of the technology, which is made entirely of biocompatible materials, was demonstrated both in bench tests and a pig model. The UBC researchers intend to further refine their device before putting it through clinical trials and bringing it to market. 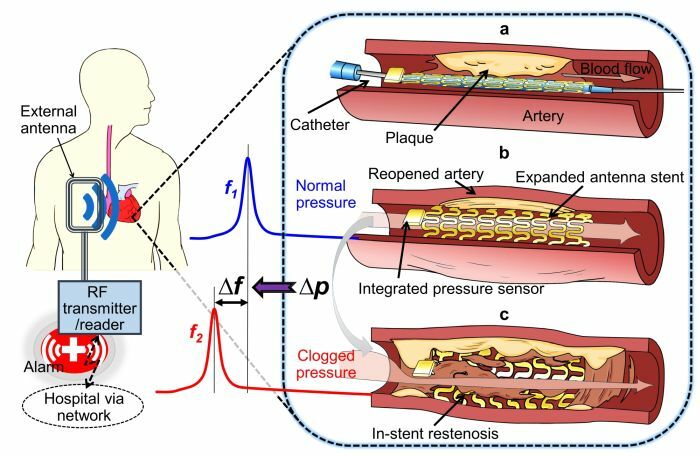 “We hope that our stent will not just help people with restenosis, but lead to the development of other smart implantable medical devices, too,” says Kenichi Takahata, a professor of electrical and computer engineering at UBC who led the study. Takahata’s team recently embarked on a new research project, co-funded by the Canadian Institutes of Health Research and the Natural Sciences and Engineering Research Council of Canada, to develop a smart ureteral stent that can detect blockages between the kidney and bladder. If successful, the device may help prevent kidney swelling (hydronephrosis) and eventual failure. Atherosclerosis, or the thickening of arteries, is the leading cause of death in the developing world. Each year, millions of people receive stents in hopes of restoring normal blood flow through their bodies. However, as many as 40 per cent of people with bare metal stents experience re-narrowing of their blood vessels, usually within three to six months after implantation. Drug-releasing stents reduce the chances of restenosis, but may also increase the risk of blood clots and heart attacks in the future. This research was recently published in Advanced Science, which featured the paper on its front cover.